The Board of Directors of The Community Fund of Darien announces Carrie Bernier’s departure as executive director. Bernier will join the Norwalk Community College Foundation as executive director in June. Bernier assumed leadership of The Community Fund in 2013, and drove the organization’s innovation to better respond to critical human service needs in Darien, Stamford and Norwalk. “Under Carrie’s leadership and innovation over the past five years, we grew as an organization and adapted to the changing needs of our community. We are proud of our growth and energized by the commitment of our engaged and dedicated staff, board, advisory board and volunteers” said board President Steve Ward. 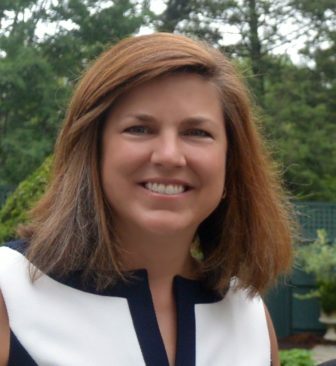 Carrie Bernier has been the executive director of the Community Fund of Darien since 2013. Formerly an attorney practicing criminal and family law in Stamford, Carrie served as an assistant state’s attorney in Stamford Criminal Court prosecuting crimes of domestic violence and as the legal director of the Domestic Violence Crisis Center. For over 20 years, Carrie has brought her passion for advocacy and systems change to her work in the nonprofit sector. Carrie has a B.A. from Boston College, a Master’s Certificate from the McCormack Graduate School of Policy and Global Studies at the University of Massachusetts, and a J.D. from Pace University School of Law. Carrie lives in Darien with her husband and four daughters. Over its 67-year history, the Community Fund has evolved as a thought leader on local philanthropy. Bernier is credited with increasing the transparency and accountability of the fund’s grant investments by tracking impact using results-based accountability and funding goals based on needs assessment. Bernier also positioned the fund to receive a $500,000 grant from the state Department of Mental Health and Addiction Services to develop a five-year strategic plan to prevent underage drinking in Darien. The provocative “Our Darien” social media campaign continues to change parent and teen behavior around alcohol. After recognizing a gap the nonprofit sector’s use crowdfunding technology for cost-effective and efficient online fundraising, Bernier helped launch TheImpactVine.org, an innovative crowdfunding site for local nonprofits. Board of Directors member Cindy Banks will lead the search committee to find Bernier’s successor. During the transition, the Community Fund’s highly competent staff, with a combined 35 years of experience at the Community Fund, will step up to lead their respective departments. Board Secretary Frank Huck and President Steve Ward will oversee the office. In the coming weeks, the Search Committee will be posting details on the process and timing of the search for a new executive director. Please direct all inquiries to: info@communityfunddarien.org. Through a crowdsourcing website that Darien nonprofits are beginning to use, you can now contribute to a specific cause for a specific group in town, and one of the first local nonprofits to use it is At Home in Darien, which wants $1,065.74 to replace brakes and tires on its van for seniors. Actually, At Home now wants $565.74, after the law firm of Wofsey, Rosen, Kweskin & Kuriansky gave $500 to the cause.